Copper Mountain Resort was testing its new American Eagle gondola last week when one of the cabins broke free and crashed to the ground just after exiting the base terminal. Because it was not open to the public, no one was injured. A plumber operating in Summit County is in hot water after failing to complete a number of jobs he agreed to take on from residents around the county this year. Law enforcement authorities are accusing him of stealing thousands of dollars from multiple victims in the process. Tracey Craig Tucker, 49, is charged with class-five felony theft, reserved for individuals who have stolen between $5,000 and $20,000, and appeared in Summit County Court last week for a disposition hearing. “Bindu had an infectious energy that kept everyone around him excited to be on the mountain and especially in the backcountry,” his friend John Spriggs said. Motorists waited out an intense storm system last weekend at Summit Middle School as the winter weather caused traffic to grind to a halt on nearby highways and roads. 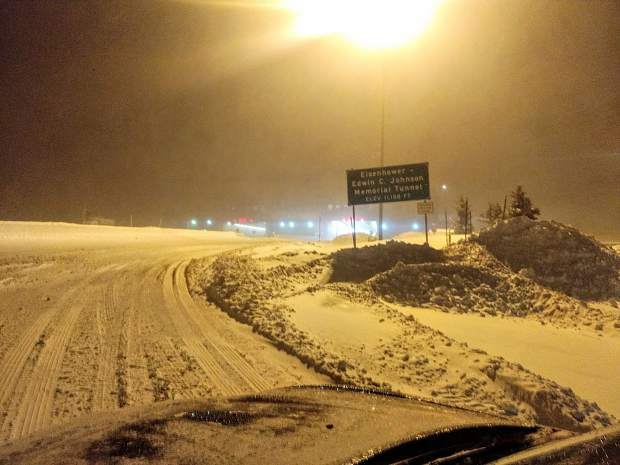 Across Summit County, accumulations were reported from 8 to 12 inches that began on Friday, Nov. 23 and didn’t end until early Sunday morning. As the holiday traffic on Interstate 70 came to a standstill on Saturday in Summit County, officials turned the school into a makeshift shelter. Well over 100 stranded travelers sought refuge at the school. The primary cause was a 20-car pileup on Interstate 70 East between Frisco and Silverthorne. No major injuries were reported in the crash involving so many slow-moving vehicles but it closed the interstate for about six hours. The man responsible for an assault that sent a Breckenridge man to the hospital with serious head injuries earlier this year has been sentenced to three years in prison. Charles J. Moser, 23, of Washington pleaded guilty in district court earlier this month on charges of felony assault and unlawful possession of a controlled substance stemming from a pair of incidents this July.